The Carb-Sane Asylum: #LCHFollies ~ Is there a place for beer, wine, spirits in the Banting lifestyle? #LCHFollies ~ Is there a place for beer, wine, spirits in the Banting lifestyle? What? This is a serious question? Why yes it is! I've got some things to say -- hopefully in the next week or so -- about Tim Noakes running afoul of the Health Professions Council in his country for advocating a woman wean her child onto a LCHF diet. But I had a Twitter exchange of my own the past couple of days, in which I basically encouraged folks to hijack the #WeSupportTimNoakes hashtag. This is being started to, well, support Noakes against his percieved persecution. 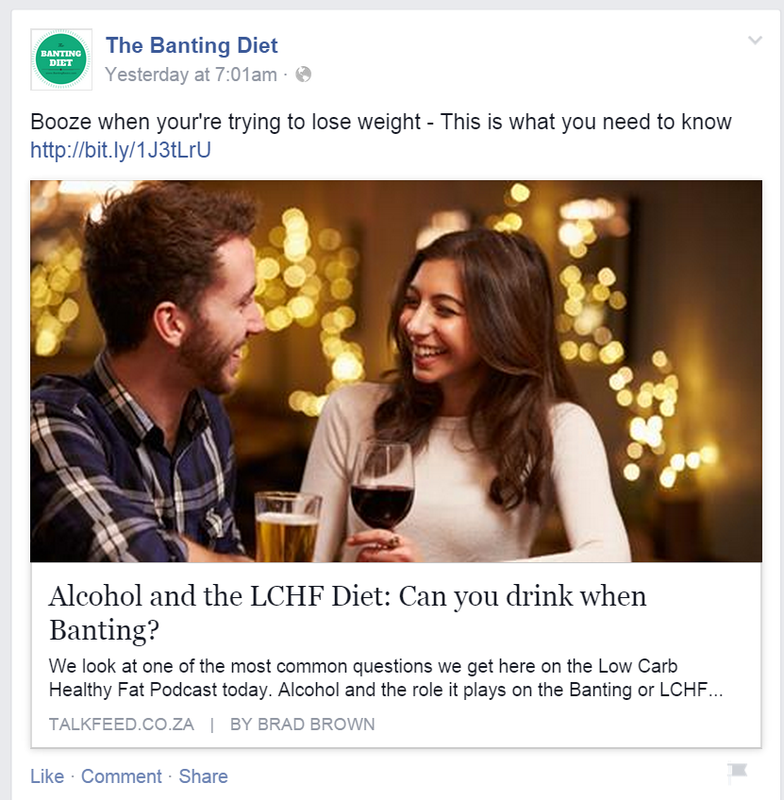 Said Twitter exchange took me to a podcast page with a sidebar image showing the Facebook post screenshot below, and leading me to this podcast: Alcohol and the LCHF Diet: Can you drink when Banting? No ... not the Onion website! Here's the deal. Tim Noakes starts out on shaky ground by calling "his" diet Banting. The low carb advocates have now also dug in their heels by insisting that it's a high fat diet, and we're talking at least 60% fat here -- most don't seem satisfied unless they are upwards of the 70% mark. This has not been a human diet consumed even by the Inuit, and even IF the Inuit diet were composed of less flesh and more fat, it would still be relatively low in saturated fat which is the kind of fat the #LCHF folks now seem to swap the H = high out for H = healthy for (and high in PUFA, especially omega 3, and HUFA = highly unsaturated fatty acids - especially compared to basically any commonly consumed domestic animal meat). So Prof. Tim Noakes' diet is predicated on a LIE. Why do I say that? Because, first, I don't believe there's any evidence that some supposed higher protein lower fat version of the diet was popularized and Banting considered it inferior. In many ways, I'm not sure who is more mischaracterized by the militant-LCHighFers: Ancel Keys or William Banting. The popularized mischaracterizing all seems to trace back to representations by one Gary Taubes. The items from which I was advised to abstain as much as possible were: Bread, butter, milk, sugar, beer, and potatoes, which had been the main (and, I thought, innocent) elements of my existence, or at all events they had for many years been adopted freely. For breakfast, at 9.0 A.M., I take five to six ounces of either beef mutton, kidneys, broiled fish, bacon, or cold meat of any kind except pork or veal; a large cup of tea or coffee (without milk or sugar), a little biscuit, or one ounce of dry toast; making together six ounces solid, nine liquid. For dinner, at 2.0 P.M., Five or six ounces of any fish except salmon, herrings, or eels, any meat except pork or veal, any vegetable except potato, parsnip, beetroot, turnip, or carrot, one ounce of dry toast, fruit out of a pudding not sweetened, any kind of poultry or game, and two or three glasses of good claret, sherry, or Madeira— Champagne, port, and beer forbidden; making together ten to twelve ounces solid, and ten liquid. For tea, at 6.0 P.M., Two or three ounces of cooked fruit, a rusk or two [bread], and a cup of tea without milk or sugar; making two to four ounces solid, nine liquid. For supper, at 9.0 P.M. Three or four ounces of meat or fish, similar to dinner, with a glass or two of claret or sherry and water; making four ounces solid and seven liquid. For nightcap, if required, A tumbler of grog—(gin, whisky, or brandy, without sugar)—or a glass or two of claret or sherry. I have highlighted the foods disallowed on Noakes' plan in bold, the items allowed and/or encouraged on his plan but avoided by Banting in bold-blue, and the alcohol in bold red. There were specific PROHIBITIONS on fatty meats and seafood. Salmon? Not on Banting's menu. Nor pork for its "fattening nature". Banting -- himself -- added: "I can now also state that eggs, if not hard boiled, are unexceptionable, that cheese, if sparingly used, and plain boiled rice seem harmless." And of course, NO BUTTER. So ... Is there a place for beer, wine, spirits and that sort of thing in the Banting lifestyle? Answer: Yes! On a genuine Banting diet, you can enjoy several glasses of wine or booze a day, just lay off the beer and Bullpoopful coffee. Sounds pretty cut and dried to me. The diet Banting followed. Reminds me of Tom Naughton's terrible documentary. He demonstrated that he could lose weight by cutting calories and walking more. Groundbreaking. "Kids and the Banting Diet: What every parent should know." A diet containing 35% alcohol is absolutely essential when your baby is teething. It's great for parents too! Most of the comments about calories on MDA are from young men who are always telling small women that 1800 cal a day is 'starvation.' I was annoyed with Mark's latest comments about metabolic slowdown. The research is clear that the slowdown happens with any caloric deficit, and it is relatively minor--otherwise no one would ever lose weight. Mark Sisson seems mainly concerned with selling his own products these days. . . . This is NOTHING new. MDA exists to sell books and supplements, and now useless PBP Certs and whatever else he can dream up. He actually makes no bones about it, and will tell you that flat out. He did with me. Sarah Ballantyne (The Paleo Mom) did a presentation at Paleo f(x) 2015 on the dangers of the ketogenic diet. Jimmy gave one on the benefits of ketosis. I wasn't able to view either because of the borked up livestream they had, but followed Jimmy's updates on Instagram. Ballantyne's presentation looked to be quite reasonable and scientifically sound. Of course, she received some strong pushback from Jimmy and some of his followers on IG. Jimmy kinda looks like he may have lost a pound or two since last seen. Might be the "extra" carb grams he's consuming. Does this look like he's lost ANY weight?? What's funny now is that Naughton is now having to defend his current diet because it is nowhere close to ketogenic, and has some carbs and is very high in protein. He eats baked potatoes sometimes! There's a lot of dogmatic keto followers in the LCHF circle that really push their diets as low protein as well (too much can cause the body to convert it to glucose, after all). This puts Naughton in a wierd spot because he is no longer in ketosis or following paleo, yet is still in the LCHF blogosphere. What's really funny is when someone dares question Jimmy Moore's extreme diet and Naughton gets super defensive, even though in his exact post he says that ketosis was not natural or probably not used by our ancestors for prolonged periods of time. That was taken at PaleoFX during his presentation. Some initial pictures looked promising for Jimmy. I do wish him well in getting control over his situation, though I doubt diet will ever be the answer for him and he seems uninterested in exploring anything outside that realm. But these pictures indicate otherwise. Naughton still uses the "out" that Jimmy is some special "weight loss resistant" type. Unfortunately, Jimmy has demonstrated time and again that this is not the problem. Naughton should be fun to watch for the next couple of years. The 2015 Disc Golf Showdown at the Farm ought to be interesting. One day Jimmy Moore is going to find out that his obesity can be cured by a diet that fixes his gut bacteria. whole grains, traditional Chinese medicinal foods and prebiotics. ..."
Oh no, not whole grains! That argument drives me crazy because it is refuted absolutely by his enormous weight loss on a candy-laden low-fat diet. It wasn't Little Debbie that screwed up his metabolism, it's Kerrygold. Do you think bariatric surgery will be his only hope, Obi Wan? His profile looks so different from his portrait angle… and I'm talking about his head. He's not hungry? Then why is he always regaining lost weight? It's because Jimmy is a liar. His losses show that he isn't any special snowflake when it comes to weight loss, but he gains because he indulges in things like frankenfoods (his first regain after Atkins), and who knows what he was eating after NK to regain. Add some carbs to all that Kerrygold and weight gain is guaranteed. He regains weight because it is very hard to maintain weight loss. It requires a lifestyle change + an understanding on how weight / fat mass dynamic really works. The guy does not seem to understand that his fat tissue is an organ that tells his brain something regarding energy status. There is more to it of course, but I can't see a guy like JM keeping his weight loss unless he is very active about it for like 15-20 years. Won't happen as long as he keeps his idiotic ideas about diet. I have maintained a 150 lbs weight loss for over 5 years, and I know what it takes. You are absolutely right about his 'idiotic ideas' about diet. I don't know how much of those 'idiotic' ideas are due to ignorance, gluttony, or greed. He wants to maintain his self-proclaimed role as low-carb guru [greed] while refusing to accept the fact that obesity is multi-faceted. It's so obvious that he loses when he eats less, but he insists that calories don't matter--which I suspect is less ignorance than gluttony. He wants to think he can eat mountains of low-carb food and still lose weight. The gains, of course, are purely hormonal--like his assumed 'cortisol' issues due to stress. As Gandalf said, he should "go back to the shadow whence he came". The real issue: his ego. His lingering obesity, no matter what dietary intervention he chooses, is a manifestation of said ego. It would do him a lot of good to disappear from the nutritional arena, from a discreet back door preferably. Congrats on your maintained weight loss by the way! Jimmy has convinced himself that this is his calling from God. At this point I don't think even a massive heart attack from which he survived would change him in his course. I agree, but for the last sentence. He doesn't need to add carbs to gain weight. This idea that "carb creep" is really the issue is just another version of the same delusion. There's NO special magic that adding 50 g of incidental carbs in 300 calorie a pop LCHF treats is causing. It's the calories. Nope. It'll take a fatal stroke or coronary to get him to exit the scene. Then he'll be eulogized by the LCHFrs for his "contribution to the cause". I totally agree that 'it's the calories.' My concern is that if he's eating carbs (and not just an 'incidental amount') along with all that fat, he's setting himself up for a cardiac event. I agree, but I don't know who is more ignorant, JM himself or his 'followers.' I read on LCF, and I cringe when posters proclaim (or are advised by others) that they need to 'add more fat' to lose weight. Thanks to JM, it's not 'low carb' any longer; it's high fat eating. Few are losing weight because of the calories involved with these fat-laden meals--and their solution is to just add more fat! These people are morons, but Jimmy bears some responsibility for his moronic advice. Strange that Seth Roberts' autopsy report has never come to light. Does "Nutritional Ketosis" Require 85% Fat? "...of course, if one eats too much fat during that low-carb diet, you're not going to lose weight; there are differences in metabolism, but calories count in the process of eating a low-carb diet." Calorie Rants and Ketosis (part 1). Calorie Rants and Ketosis (part 2). "I think this quote from Kurt Harris in a comment thread at FTA sums up Jimmy and his followers pretty well. 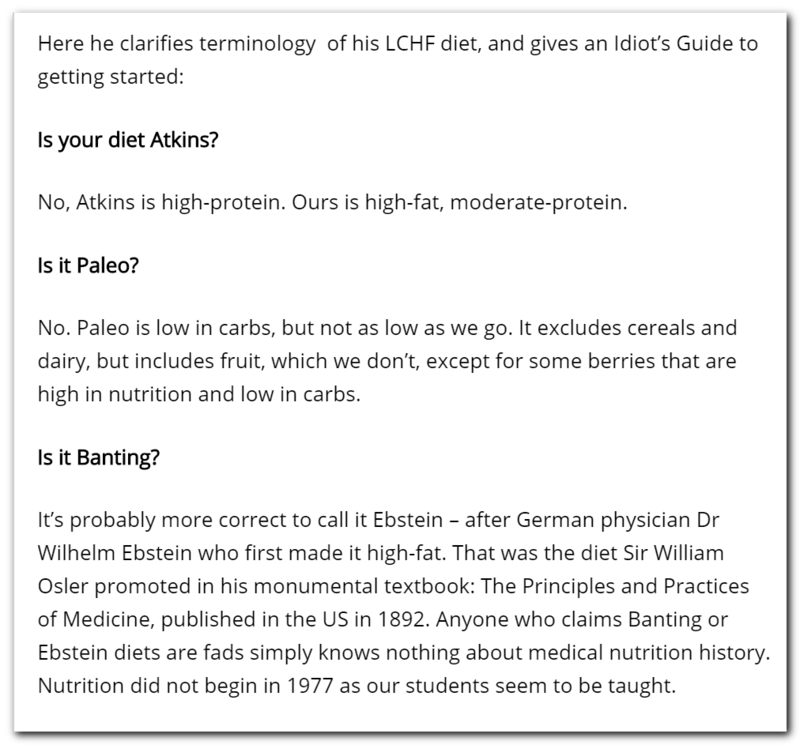 “As far as Jimmy goes, he simply can’t reassess low carb, even though he has already had countless guests explain to him that the CIH is wrong and why. Jimmy is basically boxed in at this point. Jimmy Moore Shows You How To Do Nutritional Ketosis. So you've got a carb tolerance level and a protein threshold level. Incidentally, my carb tolerance is right at 30 grams. I can eat about 30 grams of carbs, total carbs. I don't count the net carbs. That's a scam. Please run far away from the net carbs and -- what were they called? "Effective carb." I've heard all kinds of marketing terms, but total carbohydrates is what I'm talking about here. So 30 grams of that, about 80 to 100 grams of protein -- it depends on -- if I'm exercising that day, I'll probably do a little more protein, but for the most part between 80 to 100 grams. Then the third leg in that stool is dietary fat, and this is the one that freaks people out. They're like, "What do you mean I eat more fat? Doesn't that clog your arteries and lead to heart disease or raise your cholesterol?" So we address that in my last book "Cholesterol Clarity" so please go check out that book if you're concerned about that, but once you understand and have a purpose in mind that you want to get into ketosis, you probably have to start eating more fat than you ever have thought about in your life. For me personally, it's probably, Christopher, about 80% to 85% of my nutritional intake is from dietary fat, and when I say fat, I'm not talking about vegetable oils. I'm talking about real, food-based saturated -- which is like coconut oil, butter, full-fat meats and cheeses, cream, those kinds of things, and then monounsaturated fats, things like avocados, avocado oil, macadamia nut oil, olive oil, those kinds of things. So that's what it takes to get into ketosis and when you do that, you will shift from being that sugar burner into a state of ketosis which makes you a fat-burning machine. Dr Oz - You know that if I had my way, we’d all be eating fresh, wholesome vegetables, fruits and whole grains at every meal. Not surprising. Atkins never had a post mortem. And Pritikin's autopsy was completely serendipitous, considering he was admitted under an assumed name. At least it was published, though. Not a speck of visible atherosclerosis. Impressive. He's setting himself up for a cardiac event, full stop. I'm not talking about vegetable oils. I'm talking about real, food-based saturated -- … coconut oil… and then monounsaturated fats, things like avocados, avocado oil, macadamia nut oil, olive oil, those kinds of things. Somebody needs to teach Jimmy the difference between vegetable, animal, and mineral. Last I heard, coconuts, avocados, macademia nuts, and olives were "vegetable". Cue the Gilbert and Sullivan music. Interesting that when I proposed the Newcastle protocol to Christine, she could only think of how miserable she was on the 1000 cal/day fat fast. I didn't even catch it when she wrote that. Ballantyne's hot on the trail of ketosis for about 3 years now. I can't believe she couldn't connect the dots all these years. Especially about sepsis and the immune dysfunction and ketosis. This was an open secret in the low-carb world for the last 10 years. She now finally gets it and her doctorate was in immunology? Listen to her podcast. She's really upset, frantic and is getting stressed out. That PaleoFx speech was an enormous undertaking. We're seeing the beginning of the Low-carb / Paleo Crack Up. But even Paleo won't survive after the separation. If you missed the PaleoFx, listen to her podcast. Yes, her podcast on this topic is quite good - gained a lot of respect for her from listening to it. And yes, her presentation at Paleo (fx) must have taken a lot of courage. Whether anyone will heed her warnings remains to be seen, but I kinda doubt it. I've noticed a real doubling down on the ketogenic diet in several low-carb Facebook groups where sticking to 20g of daily carbs isn't good enough. The trend is to see how close to 0g you can get and it's worn as a badge of honor. The gender composition of these groups is 99.999% female. Some of the weight loss transformations within these groups are quite impressive, which is probably going to be the difficult thing to overcome regarding the health impacts of the diet. Many also claim they have more energy and their health has improved overall from following a ketogenic diet and there's no convincing them otherwise. It's sort of Atkins on a cocktail of crack and steroids. I witness this all the time on a LCHF Facebook group I follow. It's not hard to predict the replies to "I'm stalled..." It's invariably eat more fat - usually the Rx is BPC - and reduce protein. And calories don't matter - just total carbs. I can also predict the responses for leg cramps, hair falling out in clumps, and sugar cravings. My favorite has become "bad reaction" to sugar alcohols. It's my understanding that Christine has elevated insulin which is NOT diabetes. It may be entirely due to her weight gain over the past year, who knows. I doubt Newcastle is the right approach for her. A lower fat high carb diet like she probably used to eat, on the other hand, would likely work wonders. Jimmy's concept of food is distorted. I read a few of the links so may be in this same one or not, but he calls veggie oils "man made" but then cites coconut oil as a good oil. Last I checked, oils didn't just jump out of coconuts, macadamias, avocados and such either. The number one "bad boy" of veggie oils is soybean oil, which is probably about as easily created from the beans as nut oils are from nuts. It looks like living with a health and fitness "expert" is really, really bad for you. New Diet Taps into Pioneering Concept to Help Dieters Lose 12-23 Pounds within Just 21 Days! EasyHits4U - Your Free Manual Traffic Exchange - 1:1 Exchange Ratio, Business social network. FREE Advertising!